I remember getting one of these for Christmas. Thomas Edison once said, “Time is really the only capital that any human being has, and the only thing he can’t afford to lose.” The alarm clock woke us, with a loud buzzing or beeping sound, from precious time sleeping to begin our days. Alarm clocks have certainly evolved since they were first introduced. The very first alarm clock dates back to the 400’s BC. Plato was said to have owned a water clock, with an unknown signal, that woke him for his early morning lectures. Water clocks were used for many years. The first clock known to strike once each hour was in Damascus, Syria. It was constructed by an Arab engineer in 1154. Beginning in the 14th century, clock towers in Europe were introduced and capable of chiming on the hour. The most famous clock tower still standing is located in Venice. Mechanical alarm clocks, set by the user, date back as far as the 15th century, but it wasn’t until the mid-1800’s that a French inventor patented the first adjustable mechanical alarm clock. In 1942 during World War II production of the alarm clock, like many other goods, ceased so that factories could be used for war work. By 1944 production was resumed for the alarm clock, because many of the clocks that were being used began to fail and men were late for their scheduled shifts for their jobs that were critical to the war effort. Pre-war designs were made as well as new designs. The first radio alarm clock was introduced in the 1940’s. Have you ever walked into an antique store, seen something from your childhood and thought, “that can’t be an antique; I used to have one of these!”? When I saw this wood tennis racquet that was my thought, and I was stopped in my tracks. I have played tennis since I was very young, and the wooden racquet was the first that I ever played with. I remember being a child and getting frustrated when trying to tighten the screws of the wood tennis cover. Leaving the cover off was not an option, because my mom or dad would simply tell us to put it back on! It was a short time that I played with one of these racquets. In the late 1960’s, Wilson introduced the first steel racquet; the T2000 was made popular by Jimmy Conners. Aluminum racquets soon were produced. Lighter than steel, and more flexible, they still did not provide the accuracy of a wooden racquet. Many top players of the game continued to use wood. By the mid-70’s, aluminum construction improved, and the first oversized racquet was brought to the market. Graphite composite racquets were made in the early 1980’s and soon replaced all other racquets. The last wood tennis racquet was used at Wimbledon is 1987. Today, composite racquets are the standard. Having played tennis for the majority of my life, I have used a number of different racquets. From wood to steel to graphite, I have held and played with many. Seeing the wood racquet, with that wood brace across the head, made me think about the progression of technology in my lifetime. It makes me wonder what could be next in the world of tennis racquets. Who doesn’t remember this collection of books? If you never read them, you most certainly have seen or heard of them. This classic series was first published in 1904, the last in 1979, and included 72 titles. The stories told the adventures of the children of the Bobbsey family, which included two sets of twins: Nan and Bert and Flossie and Freddie. While the first volume was authored by Edward Stratemeyer, many others writers contributed to the series. The first books in the beloved series were set up chronologically, and the characters aged 4 years. After the fourth book, the editors soon realized that the characters would age too rapidly to retain their readership and kept them in somewhat of a floating timeline with the older twins remaining at age 12 while the younger two stayed at age 6. The earliest books involved a series of adventures, but as the popularity of Nancy Drew books and the Hardy Boys began to grow, detective plots made their way into the Bobbsey Twins stories as well. Initially, the books had little connection to the real world, but as the series grew, many tales included well-researched real life places. There were at least two attempts to launch a new series after 1979, but neither one of those saw the popularity that the original held. The Big Chief tablet certainly brings back memories of elementary school! I loved writing on the wide-lined paper. To this day, I prefer wide-ruled paper compared to narrow-ruled. You can still buy Big Chief Writing Tablets for your children, grand children, nieces and nephews! You might even want to buy one for yourself For Old Times’ Sake! An interesting fact is that in the 1994 film “Forrest Gump,” Forrest can be seen getting on the bus holding a “Big Chief Tablet” and it also appears in the famous “run Forrest, run” scene. Another interesting fact about a popular writer: Hugo Award winning Science Fiction Author, Connie Willis writes her books by hand on Big Chief Tablets which she buys in bulk. Did you know this about the Big Chief Tablet? Big Chief Tablets were made of newsprint paper. The wide-ruled lines is easier for those learning to write. Western Tablet produced the Big Chief and trademarked in 1947. The Big Chief usage peaked in the 1960s but found a new competitor. The spiral notebook became popular in the 60s and began to claim a bigger market share. Big Chief tablet halted production in 2001. American Trademark Publishing resumed production the Big Chief Writing Tablet in 2012. Did you ever play the Game of Cootie when you were growing up? The Game of Cootie is a children’s roll-and-move tabletop game for two to four players. The object of the game is to be the first to build a three-dimensional bug-like object called a “cootie” from a variety of plastic body parts. I spent many hours playing it and loved every minute of it! Did you know these interesting facts about the game of Cootie? 1) The Game of Cootie was created by William Schaper and was launched in 1949. 2) It sold millions in its first years. 3) In 1973 Cootie was acquired by Tyco Toys and, in 1986, by Hasbro subsidiary Milton Bradley. 4) In 2003, Cootie was named to the Toy Industry Association’s “Century of Toys List” of the 100 most memorable and most creative toys of the 20th century. 5) Cootie, the plastic bug, has become an icon, and, for some, a symbol for the baby boomer generation. The Slinky Toy – Didn’t We All Play With This? Didn’t we all have one of these? * The Slinky is a toy that is a precompressed helical spring which was invented by Richard James, a naval engineer, in the early 1940s. * It was demonstrated at Gimbels department store in Philadelphia in 1945. It became an immediate hit, selling its entire inventory of 400 units in 90 minutes. * The Slinky was originally priced at $1 and has remained modestly priced throughout its history. * The Slinky is best known for being able to travel down a flight of stairs end-over-end as it stretches and re-forms itself with the help of gravity and its own momentum. * The Slinky was inducted into the National Toy Hall of Fame in 2000. * Slinky was named to the Toy Industry Association’s “Century of Toys List”. This is a roll call of the 100 most memorable and most creative toys of the twentieth century. That’s quite an honor!! *It has been estimated that in its first 60 years Slinky has sold 300 million units. *In 1999, the Slinky postage stamp was issued by the United States Postal Service. *The rules that govern the mechanics of a slinky are due to Hooke’s law (a principal of physics) and the effects of gravitation. *The plastic spring slinky toy, known as the Plastic Slinky was invented by Donald James Reum, Sr. of Master Mark Plastics in Albany, Minnesota. “Arthur “Big Guy” Carlson tries to run a failing Cincinnati radio station owned by his “tough as nails” mother. His own incompetence is overshadowed by the strange employees that work at the station. From wild Disc Jockeys: Dr. Johnny Fever and Venus Flytrap to the geeky news director, Les Nessman and obnoxious advertising sales manager, Herb Tarlek. I miss this one, it was a great sitcom! The 1967 Pontiac GTO was a great classic. Found at numerous classic car auctions, it is a favorite car to bring back to life! The Convertible was a favorite to drive. about the cars of their youth! The Pontiac GTO was built by Pontiac from 1964 to 1974. From 1964 and 1965 Tempest had the GTO option. In 1966 the GTO became its own model until 1972. In 1973 GTO became an option again but for the Le Mans. In 1974 GTO then became an option on the Ventura. The GTO underwent a few styling changes in 1967. The louver-covered tail lights were replaced with eight tail lights, four on each side. Rally II wheels with colored lug nuts were also available in 1967. The GTO emblems located on the rear part of the fenders were moved to the chrome rocker panels. Also, the grill was changed from a purely split grill, to one that shared some chrome. Since the 1967 model year required new safety equipment, a new energy-absorbing steering column was accompanied by an energy-absorbing steering wheel, padded instrument panel, non-protruding control knobs, and four-way emergency flashers. A shoulder belt option was also featured, and the brake master cylinder was now a dual reservoir unit with a backup hydraulic circuit. The GTO model was revived from 2004 to 2006 model years. Pleated Ties, do you remember when they were popular? They certainly had character. 1) They were popular in the mid-’50s. 2) By the early ’60s ties became more narrow and would not hold a pleat. So, that was that! 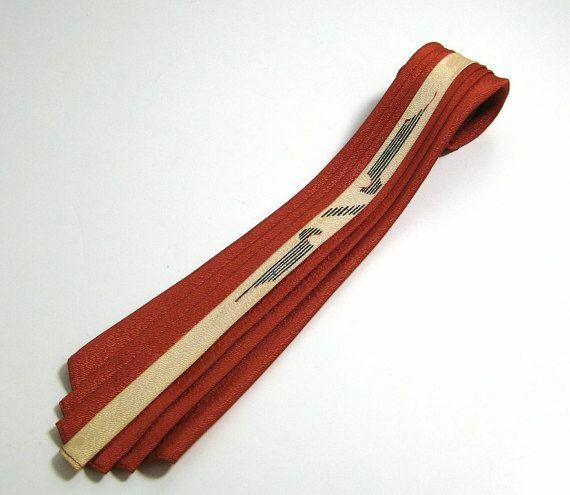 3) These neckties have an art deco look to them. 4) You tie a pleated tie in the smooth part above where the pleats start. 5) Some neck ties had six pleats and others had four. It all depended on the width of the tie. 6) Fabrics used for the ties ranged from brocade to woven rayon with ties today sold in silk fabric. 7) Yes, you can still get neckties with pleats in them today. Some are rather pricey and are high fashion.